If you’ve been to Comptoir Libanais, you may already have noticed this wall-sized face, inspired by a vintage movie poster of the beautiful Arabic actress Sirine Jamal al-Dine. Her smile can be found adorning the walls, menus and takeaway packaging across all of the restaurants but for me, hers is the face of Comptoir Libanais, Reading. Painted in bright, vibrant colours, the poster matches the bright coloured chairs and traditional café tables. Decorative ceramic wall tiles are another feature of the restaurants matched to delicate floor tiles, a traditional feature of Lebanese restaurants which really adds to the immersive experience of eating here. 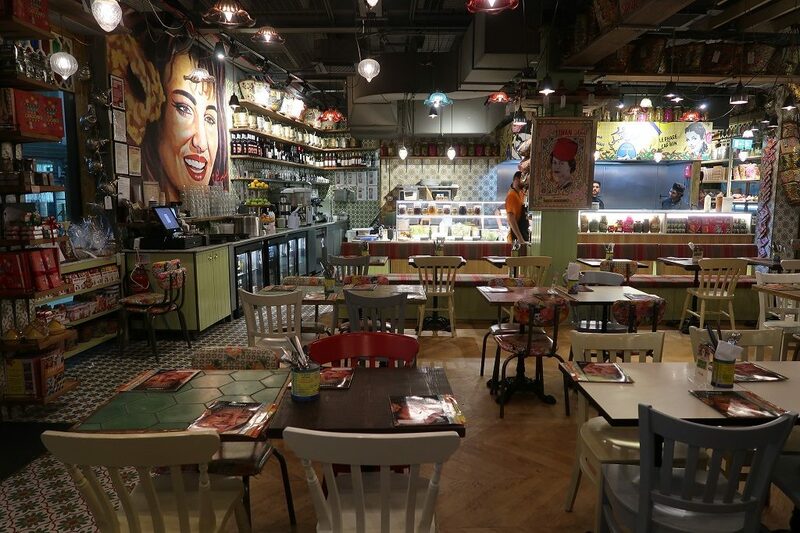 The first Comptoir Libanais was opened in 2008 by founder Tony Kitous – now there are many around the country. Comptoir Libanais means “Lebanese counter” and reflect the ethos of the brand; namely, somewhere you can eat casually, amongst friends and without needing to sacrifice the comfort and authenticity of the food. 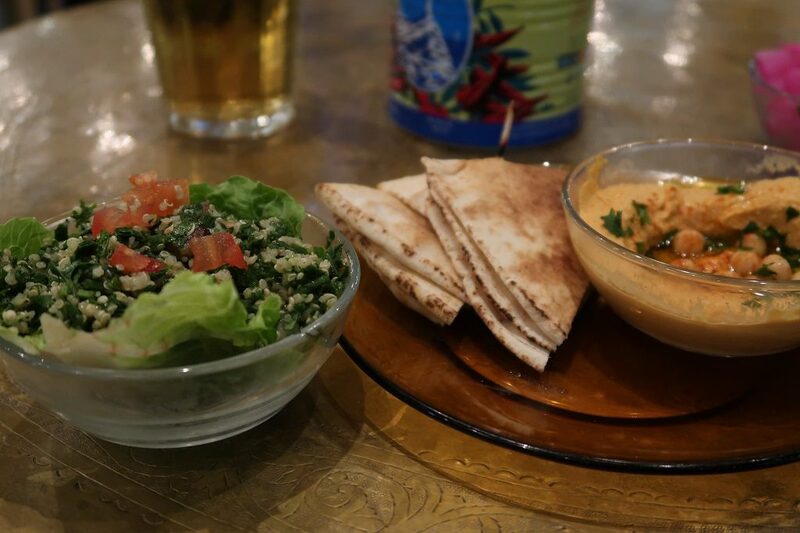 Comptoir Libanais has an extensive dining menu offering all the tastes and originalities of a real Lebanese restaurant, with a wide range of chicken, meat and fish cooked in different Lebanese styles. They also have a full and separate Vegan menu with plenty to choose from, but my date and I were here to try the new Vegan Feast menu. Service here is friendly and unhurried, with no rush to order and plenty of time to order drinks (beer, wine, cocktails, non-alcoholic and amazing coffee) and read the menu. Looking around, guests had been seated nicely spaced around the restaurant adding to the open bar-restaurant feeling and Lebanese authenticity. 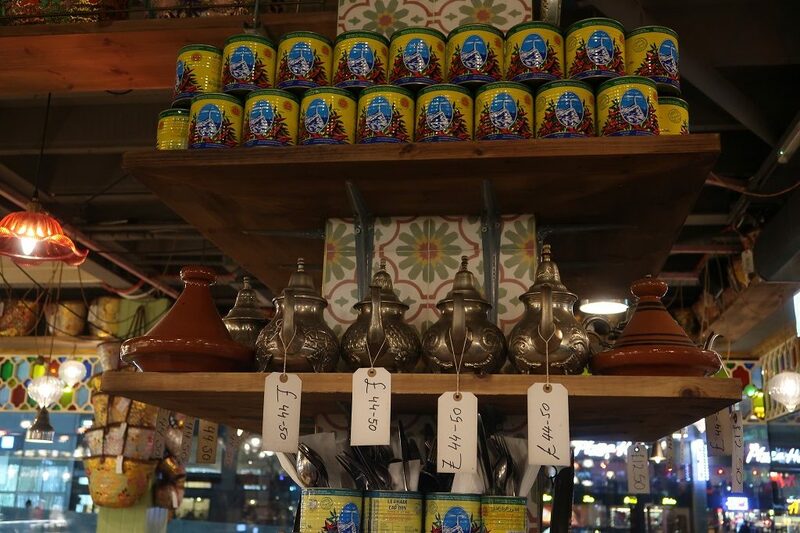 All around the walls are Lebanese artefacts for sale, bags, scarfs, T-shirts or for the more adventurous, coffee pots, aromatic spices and boxed desserts. It all helps to help pack the restaurant with colour and authentic clutter in such a good way. After a leisurely and unhurried start to the meal, we were ready for our mains. 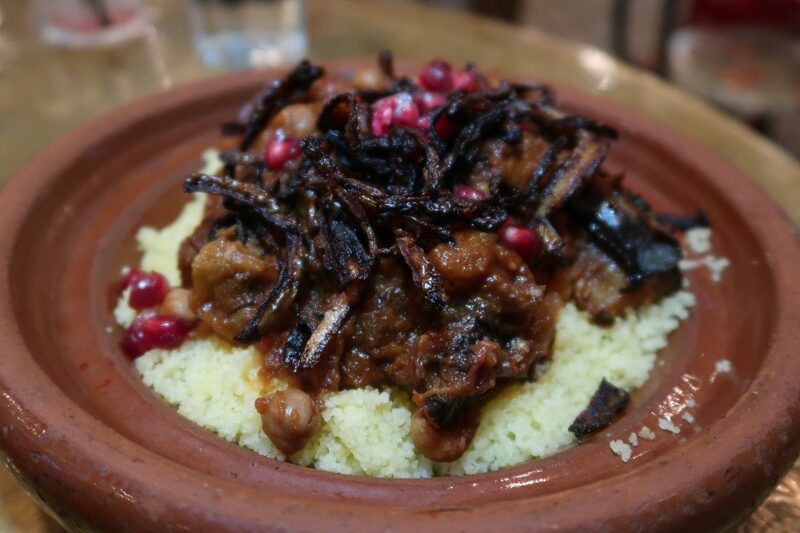 My date chose the Aubergine Tagine, which arrived hot on a bed of couscous mixed in with fresh pomegranate seeds. The flavours worked well together and had a simple yet authentic feel to it. 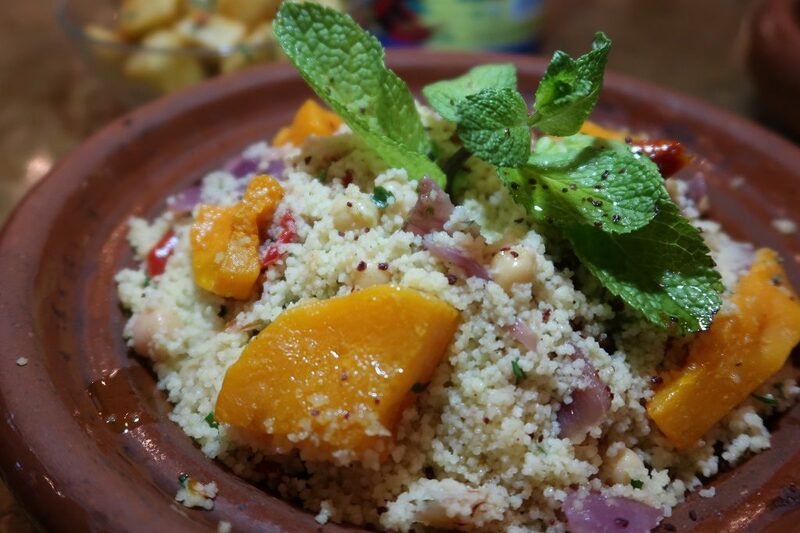 I chose the lighter Vegan Couscous Salad with Grilled Peppers, Roasted Squash and Mixed Nuts. Warm peppers and squash topped a bed of couscous and made for a filling meal, though it was noticable how fresh everything seemed. Even the mint garnish was perky – you knew this dish was freshly made to order. 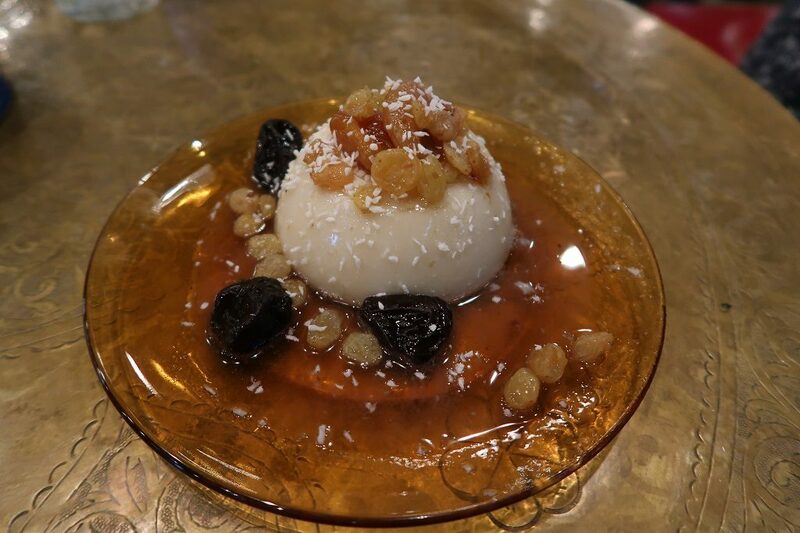 With barely enough room for dessert, we decided to share the Coconut Mouhalabia between us. A delicious firm coconut milk pudding, covered with various fruits on a honey syrup. It was perfect for sharing and washed down by green tea, really gave a nice finish to the meal. 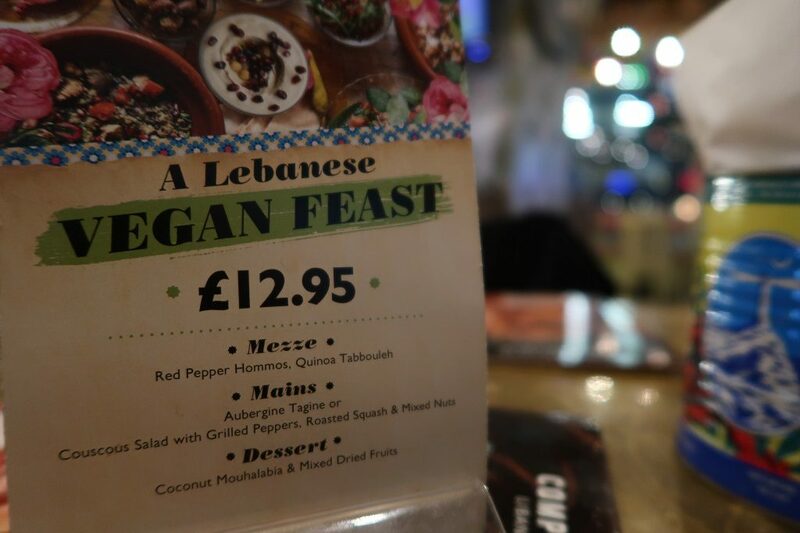 The vegan menu at Comptoir Libanais may have been launched for Veganuary, but their vegan offering is available all year round and it is a regular haunt of mine, especially when I am dining with a vegetarian or vegan friend. There are plenty of options for an omnivore with meat and cheese, but in all honesty, I rarely bother here. Food at Comptoir Libanais is fresh, healthy, unique and affordable. They have a breakfast menu too should you want to drop in for organic yoghurt topped with pomegranate and orange blossom water, porridge or even smoked salmon and scrambled eggs on brioche. A sweet tooth? Nothing is more authentic than the honeyed taste of baklawa – Lebanese pastries in a variety of flavours such as date filled semolina and walnut filled flaky pastry. These are on display at the food counter at Comptoir Libanais Reading, so you can mix and match until you find your favourite. 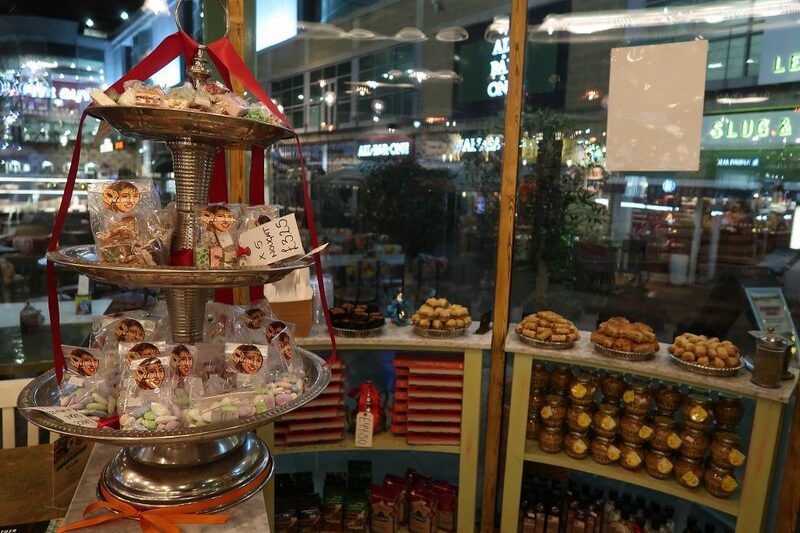 Best of all, all items can be packaged up to go, so you can have a bit of Lebanon at your desk or home. Looking for an alternative Veganuary menu in Reading? we recommend The Real Greek for classic Greek dishes, or Bel and the Dragon for local and seasonal British dishes. I didn’t know they had a branch in Reading! We keep complaining to each other that it’s a drag to have to go into London whenever we fancy going out for a decent middle Eastern meal, so we must investigate this!